Join the USGBC-Illinois Rockford Branch to learn about the latest in solar in Illinois and explore case studies that demonstrate what makes a solar installation successful. Solar prices have dropped about 75% in the last 6 years. The recent passing of the Solar Investment Tax Credit and the potential to sell Solar Renewable Energy Credits (SRECs) make the installation of solar one of the best financial options. This is best done after a building has moved towards being energy efficient. Many Business owners and architects are just beginning to assess the suitability of a solar installation. By reducing their carbon footprint, they also have an opportunity to reduce the negative impacts of fossil fuel energy use on Climate Change. 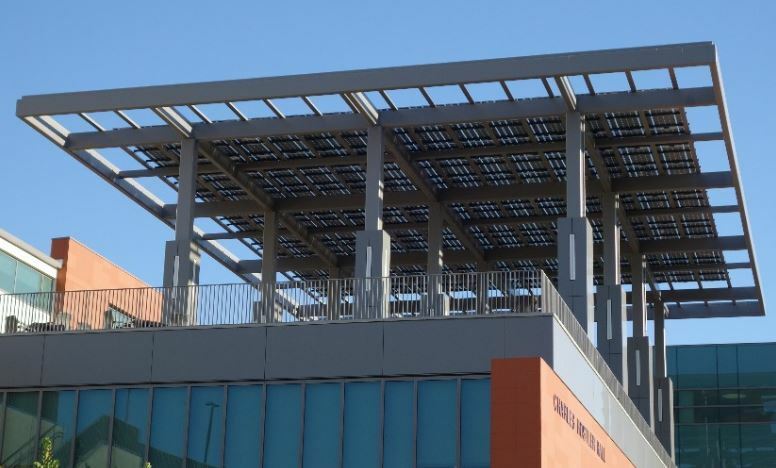 The program will examine why solar is so important to install today, how a solar installation works, describe the concept of Net Metering and using electric kWh credits, how SRECs might be an option to lower the ROI, and explore different types of installations for various types of roof systems. Additionally, discover the benefits of large solar installations through case two studies, a 450 Kilowatt installation on a school in Illinois and a proposed solar array for a private large building in Rockford. Assess the installation costs, installation process, interconnection application process, and review the actual financial numbers from the first year of operation for these two solar installations. This program will qualify for 1.0 AIA & GBCI CE hours.